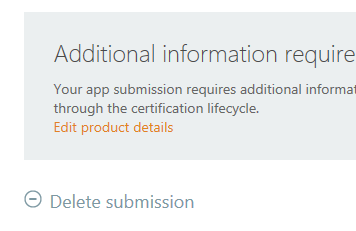 Sometimes it happens that one get to submit an app for certification and it fails. And in some cases one wish to just delete the submission after it fails – but that is not possible out-of-the-box on http://create.msdn.com. But there is an easy workaround. Edit the submission details for the failed app. Add a new XAP-file – it doesn’t have be a modification of the original XAP-file. I have replaced the XAP-file with a dummy XAP-file called “delete.xap”. Hit the “Save and Quit”-button to quit the submission. In the overview the app submission have changed state to “submission incomplete”. Click the “submission incomplete” to go to the submission details. In the bottom you will have a “Delete submission”-button and you can delete your submission – yeah!